What’s up with the spate of foot and ankle injuries in the NFL? We’re only going into the 4th week of the regular football season and already we’ve seen a huge percentage of below the knee injuries. Why? Who knows, perhaps it’s just bad luck. But we do know that the NFL team trainers have a lot to deal with this season. Here’s a list of foot and ankle injuries suffered by NFL players so far, and this may be the biggest list we’ve seen this early in the season. DeAngelo Hall of Washington is out for the season with a ruptured Achilles tendon. Brandon Bair and Wesley Woodyard, Tennessee; Dri Archer, Pittsburgh; Miles Burris, Oakland; Chris Johnson, New York Jets; Tamba Hali, Kansas City; Damien Williams, Miami; Husain Abdullah, Cyrus Gray, and Eric Berry, Kansas City, Storm Johnson, Toby Gerhart, Mickey Shuler, Paul Posluszny, and Allen Hurns, Jacksonville; T.Y. Hilton, Indianapolis; Johnathan Joseph, Garrett Graham, Andre Johnson, Houston; Calvin Johnson, Detroit; Brandon Marshall, Chicago; A.J. Green and Marvin Jones, Cincinnatti; Robert Woods, Da’Norris Searcy, and Lee Smith, Buffalo; Harry Douglas and Devin Hester, Atlanta; and Andre Ellington of Arizona. See our point? That’s a long list, and we’re especially curious about the number of high ankle sprains. We don’t recall having ever seen that many at one time – especially in week 4. Your fantasy league is under great duress this week. Jamaal Charles doing what he does best. High ankle sprains have become an epidemic in the NFL lately. Jamaal Charles of the Kansas City Chiefs, and Arthur Jones, Khaled Holmes, and Joe Reitz of the Indianapolis Colts are all on the bench with high ankle sprains. Charles and Jones sustained their injuries in games this week, and Holmes and Reitz have been sitting out since pre-season games in August. How does a high ankle sprain differ from a normal ankle sprain? In the more common lateral ankle sprain, the ligaments that surround the ankle joint are injured through an inward twisting, causing pain and swelling around the ankle. A high ankle sprain, also known as a syndesmotic sprain, is an injury to the syndesmotic ligaments above the ankle which join the two bones of the lower leg together. A high ankle sprain is caused when the lower leg and foot twists out (externally rotates). 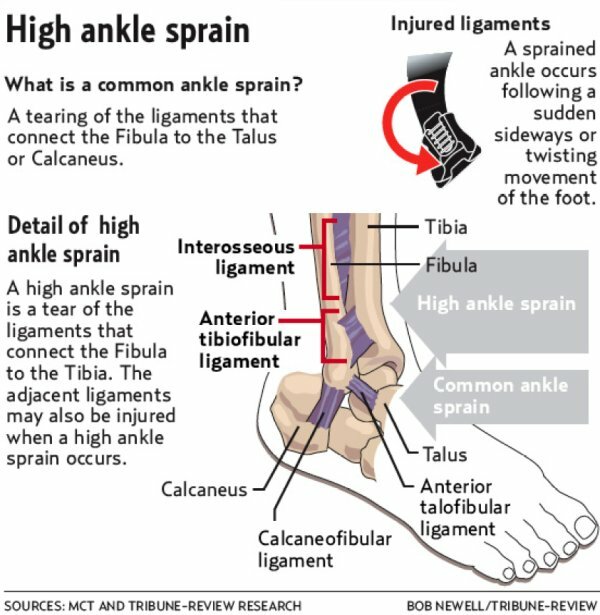 See a diagram of a high ankle sprain here. 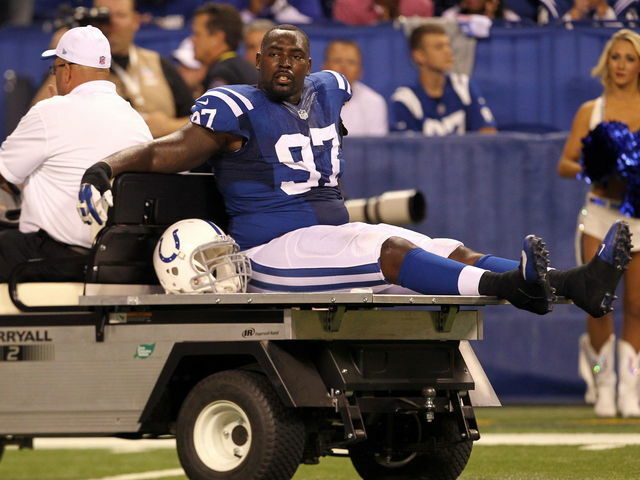 The Colts’ Arthur Jones gets carted off the field during their game against the Eagles. The tibia (shin bone) and fibula run from the knee down to the ankle. If the injury is a stable high ankle sprain, the tibia and fibula stay in their normal orientation, and the athlete may be out for as little as five or six days. If the injury is an unstable high ankle sprain, two or all three ligaments above the ankle are torn and the tibia and fibula are free to move. A podiatric surgeon may need to place a screw between the tibia and fibula to hold the bones in proper position while the ligaments heal, and may require the athlete to be sidelined for as long as 6 months(!). High ankle sprains pose a bigger challenge to healing than common ankle sprains, which is why athletic trainers are very cautious about returning an athlete to the lineup too quickly. There’s been no shortage of snow in the U.S. this year, and times are good for those who love to strap boards and skis on their feet. Although most ski and snowboard injuries involve the knees or thumbs, ankles and feet see plenty of injuries as well. Fortunately, there are a few simple steps you can take to minimize your risk of injury. The most common ski and snowboard injuries to ankles are sprains. These most often occur when you land on the outside of your foot and your foot twists too far inward. The capsula, ligaments, and nerve fibers stretch too far, or the cartilage becomes over compressed. Tissue is either torn or stretched, and bleeding and swelling occur inside the ankle, accompanied by bruising and pain. After a sprain, it’s wise to wear an ankle brace inside your boot to avoid spraining the ankle again. Fractures occur when too much stress is placed on a bone. Landing incorrectly after a jump, falling, or colliding with another skier are the most common ways a foot or ankle becomes fractured. Immediate attention is needed even for a minor fracture, as a crack in a bone left untreated will continue to be painful in the short term and will become arthritic in the long term. Ankles should be conditioned before and after a day on the slopes with simple stretching and strength-building exercises, which you can see here. And never ski if you’ve injured your ankle in any way – it’s already in a weakened state and additional stress may result in a more severe ankle injury or a problem further up your leg. You take off your ski boots and you see that the nail on your big toe is completely black. A scary site. Fortunately, it’s not too serious if you get it cared for right away. In medical terms, Skier’s Toe is a subungual hematoma, a common injury for runners as well. When ski boots are too tight or too loose, the big toe takes a lot of punishment and the nail begins to separate from the nail bed. Bleeding occurs under the nail and the result is discoloration and soreness. If you see a podiatrist right away, they can resolve your pain quickly by burning a tiny hole in the nail and allowing the trapped blood to drain. But if you wait too long for treatment, the condition might get worse. To avoid Skier’s Toe, trim your toenails, make sure your boots fit correctly, and that your socks don’t bunch up. And wear your own boots, not someone else’s. The Talus is a small bone that sits between the heel bone and the two bones of the lower leg. When your leading foot in a snowboard rotates too far, a fracture often occurs in the Talus. Snow-Boarder’s Fracture isn’t always apparent on an X-ray and can sometimes be mistakenly diagnosed as a sprain. If untreated, it will continue to be painful and become arthritic down the line. When it is caught, treatment is pretty simple, with the insertion of a screw to stabilize the joint. With any of these injuries, the soft tissue will heal naturally without much intervention on your part. However, bones, muscle, and nerve fiber do not return to their pre-injury condition without help – they must be trained via physical therapy to restore their natural function. The simplest way to avoid any foot or ankle injuries while skiing or snowboarding is to make sure your boots fit properly and your bindings are adjusted correctly, because stability inside the boot is imperative. A professional boot fitter will make sure that your foot is centered and supported correctly and that it’s not rubbing or banging against any part of your foot or shin. They may decide to insert padding in the boot or set you up with a custom orthotic, especially if you’ve had previous injuries. Also have your bindings adjusted by a professional who will use your age, ability, length of boot, weight, and height to adjust the tension according to the formula suggested by the manufacturer. Ankle pain could be more serious than you think. There are many reasons you could be experiencing pain on the inside of your ankle, known in medical terms as the medial ankle. Anything from overuse strains to very serious conditions can cause stiffness, soreness, joint deformity, and pain. The ankle is a remarkably complex connection of bone, tendons, ligaments and blood vessels and when any part is damaged, pain may be felt throughout the entire region, including the foot and lower leg. These are the most common reasons for pain on the inside of your ankle. A sprain is usually pretty obvious – significant pain, instability, and bruising usually accompany it. But patients are frequently unaware of minor soft tissue damage, especially women who spend lots of time walking in high heels. It’s easy to roll your foot while stepping off a city curb and keep going about your business. But that seemingly insignificant roll can cause significant damage to the soft tissue that surrounds the ankle. Later in the day – or even days later – it may become red, slightly swollen, feel unstable, and may be tender or painful when you put weight on it. Don’t ignore minor pain in your ankle. It should be treated by a podiatrist to avoid repeat injuries, which lead to a weakening of the tissue surrounding the ankle and arthritis. Until your appointment, rest and elevate the ankle, use ice if swollen, and control the pain with over the counter meds like advil or aleve. A stress fracture is a serious injury which requires attention from a podiatrist to stabilize the bone and heal it correctly. Stress fracture symptoms will include soreness in the ankle, swelling, instability, and pain that may radiate through the entire foot. These symptoms will worsen as you put weight on your ankle. This one is usually pretty obvious. Pain will be intense and a joint deformity is usually visible. Numbness, tingling, instability, inability to bear weight, swelling, redness, and bruising may all accompany a broken ankle. It’s essential that you have a broken ankle set correctly by a podiatrist to avoid further complications and permanent instability. An ankle with osteoarthritis may cause a minor ache or shooting pain and may be accompanied by swelling and redness. You may experience periods of stiffness, especially after long periods of rest or lots of activity. In the early stages of this disease, over the counter pain medicine may be helpful. But as osteoarthritis is degenerative, the symptoms will worsen with age, and will require attention from a podiatrist. Although symptoms of RA are similar to those of osteoarthritis, the cause is different. RA is an autoimmune disease which usually starts in the small joints of the extremities. Early symptoms will include pain and stiffness, then swelling and joint deformity as the disease progresses. Generally, these symptoms will be felt not only in the ankle, but many other joints as well. The Posterior Tibial Tendon travels along the inside of the ankle, just under the ankle bone. It attaches your calf muscle to the bones on the inside of your foot. A sudden injury or overuse can inflame this tendon, weaken it, and ultimately cause the arch of the foot to fall. Pain is felt along the path of the tendon on the inside of the ankle, which may be accompanied by swelling. With activity, the pain will become worse, making standing for a long period of time unendurable. Running will be very difficult. If left untreated, the arch of the foot may collapse, and the heel bone will shift in an outward position. The tarsal tunnel is a dense band of fibrous tissue which holds the tibial nerve and arteries. It runs along the inner leg and behind the bump on the inside of the ankle. If the tibial nerve becomes pinched, pain may be felt along the inside of the ankle all the way to the toes, and sometimes through the lower leg. This is a very serious condition which should be treated by a podiatrist to alleviate the problem causing the pinched nerve. If you suspect that you may have any of these injuries, rest and elevate your ankle, use ice if swollen or red, and use over the counter medicines like advil or aleve to control the pain. Call the podiatrists at PA Foot and Ankle Associates for an immediate examination so that we can make a proper diagnosis and heal your injury as quickly as possible. Few sports make one feel better than running: the challenge to go the next mile, to better your speed, to increase endurance. There are also few exercise programs better or more natural than running, except for perhaps swimming (gets the edge because of low impact on joints and it uses every single muscle). Did you get that part in the middle? Strength conditioning doesn’t bring every muscle and tendon along at the same rate and the weaker parts tend to get injured. And it’s different for every runner. Here then, is a list of potential foot injuries you may experience when running. Forewarned is forearmed. The most common source of heel pain for runners is Plantar Fasciitis, an overuse injury that inflames the fascia on the bottom of the foot. Pain is usually felt in the heel, but may also be felt in the arch. This may heal on its own with rest, ice, and pain medicine, but persistent pain indicates an injury that needs medical treatment. Pain in the heel may also indicate a Calcaneal Stress Fracture, a thin crack in the heel bone. This is a more serious injury that needs attention from a podiatrist. Pain from Achilles Tendon injuries typically appears in the heel area, but also may be felt behind the ankle. Mild pain could be the result of irritation of the tendon, but severe pain may be due to a full-on tear (rupture) needing surgery. On the bottom of your foot, in the area commonly called the “ball” of your foot are the sesamoid bones, located just behind the big toe. The tissue surrounding these tiny bones can become irritated from overuse, a condition called sesamoiditis. Additionally, the bones may actually fracture. Pain can be anywhere from “just hurts a little” to “I can’t even take a step without screaming”. Just as with Plantar Fasciitis, minor pain can be treated with rest and anti inflammatory pain meds, but more significant, persistent pain needs the attention of a podiatrist. If you feel pain in the top of your foot, right about at the halfway point, you might be experiencing Extensor tendinitis, an inflammation of the tendons that run along the top of the foot. Pain in the top of the foot can also be due to a metatarsal stress fracture. The metatarsals are the five long bones in your foot that connect with your toes. If you’re experiencing a “pins and needles” sensation between your 3rd and 4th metatarsals near your toes, you’ve probably irritated the interdigital nerve. This is called Morton’s Neuroma. If you have a sore or discolored toenail, you may be experiencing a subungal hematoma, which happens when your toe is constantly jammed against the inside of your shoe. This action leads to bleeding underneath the nail, creating the discoloration. Buy running shoes that fit properly. You usually know it when you’ve sprained your ankle. The tissue around your ankle discolors, and the joint is stiff and painful. This injury is not to be taken lightly – you should always have a sprained ankle thoroughly evaluated by a podiatrist. Sprains treated incorrectly (or not at all) may not heal sufficiently and are notorious for re-injury, weakening the ankle and leading to arthritis after middle age. Soreness (without discoloration) on the inside or outside of your ankle could be inflammation of the Posterior tibialis tendon or the Peroneal tendon. With these injuries, pain may also be felt along the outside or inside of the foot. Treatment of a sore area with minor pain should always start with a period of rest, ice and anti inflammatory pain meds like aleve. When and if the pain subsides, don’t jump right back in to the same running routine, because you’ll probably injure the same area once again, but this time more seriously. A damaged tendon is a weakened tendon and needs to be reconditioned before placing maximum load on it. To recondition the muscle or tendon, start with simple stretching exercises. If there is any pain at all while stretching, the injury is not yet healed and needs more rest. Only start running again when there is absolutely no pain in the damaged area. Warm up with proper stretching exercises and start with a light routine to get the foot and ankle working correctly again. Slowly increase speed and distance.